At the end of January I told you about a new relationship I was starting. I wasn’t sure where it was going but my inner voice would let me know. I am sorry to report it is not to be. I am here to tell on myself, and what I learned from this experience. choose to ignore the one thing I trusted which had never steered me wrong…my inner voice…my intuition. This was my first mistake. I will not go into the details of the break up, it was petty and stupid but the outcome would have happened sooner or later because we both were not ready for a long lasting relationship even though we both wanted it so desperately. The unprocessed emotions and conditioning from childhood and pervious relationships had never been healed, so feelings were not able to be expressed in a healthy way. We honestly thought we were right and maybe we still do, when in fact it was our own fears and insecurities and frustrations getting the best of us. I wanted so badly to give something of value to my partner that I lost site of the real picture, which was to be healthy emotionally so I could do my part of nurturing a new relationship. I know he wanted this also. I put blame on no one and I forgive us because I understand that we both still have some conditioning and unprocessed feeling to address. To many times we want so desperately to be loved by the other that they jump when we need to wait. Only to find twice the pain when it doesn’t last. Now there is grief, guilt and despair of never finding love to add to the list of emotional healing. Or maybe you are so convinced of being right in your assessment of the situation and become stubborn and unwilling to see it any other way but your way. This stubbornness then turns to anger which then leads to fear. Fear of being wrong and of complete separation. Then that turns to self criticism and finally depression. Either way, what a horrible road to travel! That was the case with us. Words were said that cut straight to the core. My professional ethics were bashed and all of a sudden he became an expert as to who I was and what my intention on everything was, (which in his eyes were completely evil.) I was described as a “broken toy” he had found to play with. He was hurting and his only defense was to hurt back. He succeeded in doing just that. I was horrified by his perception of the situation and responded as I had always done in the past….to become fearful. My flight or fight responses kicked in and I ran. It was beyond my understanding so I ran back into my shell and waited. Not sure what I was waiting for…but I waited. The following day I talked to my coach and mentor, as well as fellow life coaches and some of the students of YOU University. I was up lifted (as usual) and told I was loved and appreciated and not to worry. After first making sure I was safe, I was coached and reminded to find the lessons I was to be learn and start the healing process by using the tools I had been trained to use in YOU University and write as many “Love Letters” as necessary until I found the love and forgiveness to heal the negativity feelings towards myself and towards him as well. So this is the process I’m in at the moment. 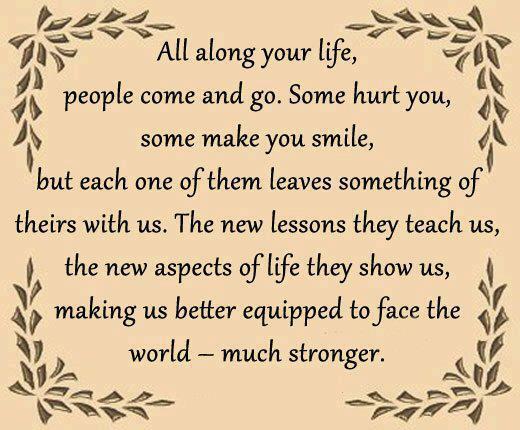 Understanding that everyone in our life is either a lesson for us or just an experience to share. When we keep with this understanding we realize that it is more harmful to hang on to the negative emotions that might come with those lessons or experiences. So processing through them is crucial to our growth and evolution as a spirit in this human existence. My hope is that he too understands this process and moves to a place of love and forgiveness with the goal of healing. I care for him still and he might not believe it, but I can not nor will I ever wish ill will to someone who has brought happiness into my life which I desperately needed. He woke up feelings in me that I forgot I was capable of feeling. I felt loved and cared for which I soaked up like a starving puppy. So I will be forever grateful to him for that. I am learning to see this experience as neither good nor bad just a necessary part of my journey. I hope someday he can feel that way too.